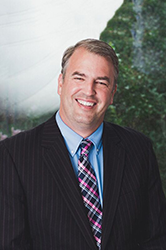 Since 1995, Roger Fuller has been helping clients reach their financial goals by following the simple advice prescribed by his Grandfather; “The only way to get rich quick is to do it slowly.” Roger began his career in the financial services industry by joining his father at Interstate Johnson Lane, a firm which was founded in North Carolina. Maintaining his Grandfather’s axiom, Roger has spent 20 years managing client expectations in order to keep them focused on long-term success. This disciplined approach requires what Roger says is critical – “building strong client relationships and providing world class service”. Dedicated to his profession, Roger has obtained several credentials including Series 7, 9, 10, 63, 65, 99, and the North Carolina Life and Health License. In addition, Roger has the distinction of Certified Financial Planner (CFP). Active in his community, he serves on the Board of Wilmington Health Access for Teens and enjoys working with many charitable organizations. When he is not serving clients, Roger’s favorite activity is spending time with his wife Haley and their 3 daughters and son. A close family, they like spending as much time as possible on the golf course and at the beach.